Dark-armored troopers stand beneath the smoldering remains of the shield generator on the Forest Moon of Endor. Their faces turn skyward to the distant menace of the Death Star looming overhead, a symbol of order in a war-torn galaxy. Like the Empire itself, the colossal battle station stands immutable, impregnable, and eternal. And with a flash of white, it explodes into a midday star. 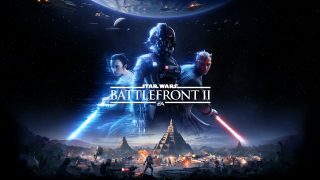 Welcome to Star Wars™ Battlefront™ II, with a new story mode taking players on an epic journey from the battle of Endor to the rise of the First Order. The prequels, original trilogy, and new era meet in a vast multiplayer adventure coming November 17 to PlayStation 4®, Xbox One, and Origin on PC. If you're a member of Origin Access or EA Access, you'll be able to start playing on November 9. Star Wars Battlefront II introduces a new single-player Star Wars™ story. You play the role of Commander Iden Versio, leader of the Galactic Empire’s elite special forces unit, Inferno Squad. After witnessing the destruction of the second Death Star, Iden’s team embarks on an extraordinary odyssey of revenge, betrayal, and redemption spanning the 30 year gap between Star Wars™: Return of the Jedi™ and Star Wars™: The Force Awakens™. Along the way, she and her companions encounter a cast of Star Wars' greatest characters. You'll take control of many of these beloved heroes in an adventure ranging across a series of fantastic planets, including awe-inspiring settings you've never seen before. These Hero characters are also highlighted in the vastly-expanded multiplayer. Darth Maul, Yoda, Kylo Ren, Luke Skywalker, Rey, and many more iconic (and feared) characters from all three cinematic eras will be playable. 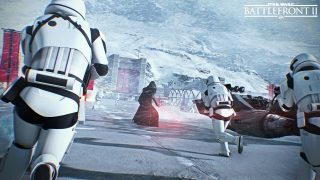 In certain modes, you'll be able to pit heroes from the prequels trilogy, original trilogy, and new trilogy against one another in combat. 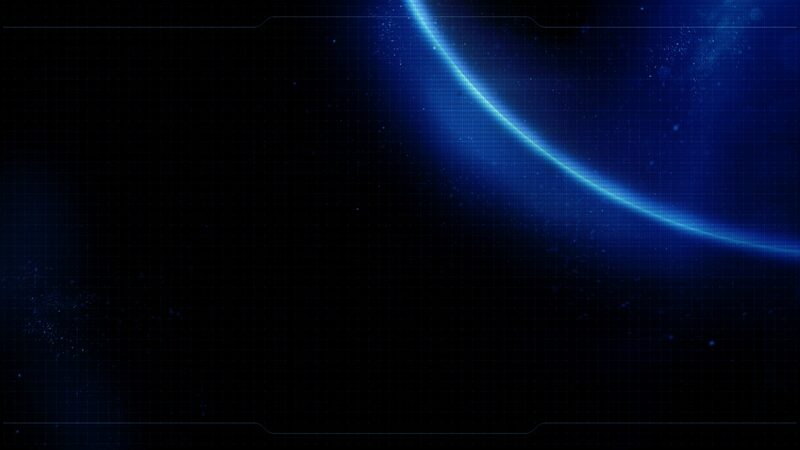 Up to 40 players will be able to simultaneously enjoy the deep class-based online gameplay, with a rewarding progression system, extensive hero customization abilities, and a larger arsenal of weapons with improved modification options. Pilot a variety of new starfighters in Space Battle scenarios, and ride tauntauns across snow-covered fields. In planetary engagements, you'll be transported to some of Star Wars' most iconic battlegrounds: Theed, Takodana, Starkiller Base, Yavin, Mos Eisley, Endor, Hoth, and more. You will also cooperate against AI foes in skirmishes that span the cinematic eras, and engage enemies in entirely new modes. Anyone who pre-orders the Standard Edition will get a whole range of rewards, including exclusive* Star Wars: The Last Jedi™-themed looks for Kylo Ren and Rey, an ability modifier that upgrades the Millennium Falcon, epic ability modifiers for Rey and Kylo Ren, and more. Players purchasing the Elite Trooper Deluxe Edition receive upgraded versions of all Trooper classes, a A280-CFE blaster rifle† instant weapon unlock, an enhanced scope modification, and an epic ability modifier. 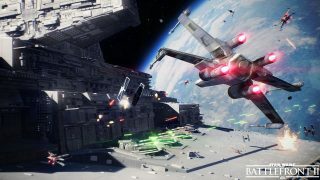 You'll be seeing much more of Star Wars Battlefront II later this summer at EA PLAY. In the meantime, keep your eyes on EA Star Wars for the most up-to-date news and announcements on what's happening next. *Exclusive to Star Wars Battlefront II pre-order and Deluxe Edition customers. † Weapon names subject to change.